In 2nd seeded PBC's first game against the 3 seed, Small Everywhere, things started off grim. After being down 13-6 after 3 innings, the defense made a few plays and the bats got hot, scoring 3 in the 4th and 3 in the 6th to cut the lead down to 15-12 going into the 7th. Small Everywhere scored 2 in the top of the 7th, but PBC rallied for 6 in the bottom of the frame, capped off by a 2 out, 2 run double by Allison. Next up was the 1 seed, Caught in a Pickle, who won a close one 9-7 to get into the championship. Despite the short break between games, PBC hot bats kept rolling, jumping out to a 12-1 lead after 3 and kept pouring it on to the tune of a final score of 33-7. 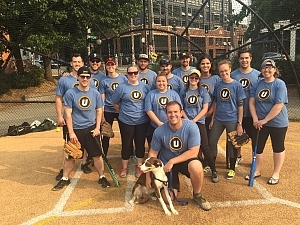 Congrats to all the teams for a wonderful season and hats off to Pickles for being regular season champs, and big props to to Pitches Be Crazy for an amazing tournament run and bringing home the coveted "Underdog Championship Wristbands!" Through both games, Alison showed off all her tools including running down line drives, laser throws and speed on the base paths. But nothing can over shadow her clutch at bat in the bottom of the 7th, 2 on, 2 out double to the gap to send her team into the Championship game. Way to walk it off Alison!! On one leg Dyllan was still able to have himself a day. On the rubber he had a three pitch inning, and at the plate he was able to limp himself around the bases for two 3 baggers and a home run. Great game Dyllan.